Small: 8 inch [20cm] circumference at upper palm. Large: 10.5 inch [27cm] cirumference at upper palm. These mittens (or fingerless mitts) are designed to accompany a hat based on a whorl1 made by the Sami people of the Artic Scandinavian region. Noall’te is the Sami word for spindle whorl. 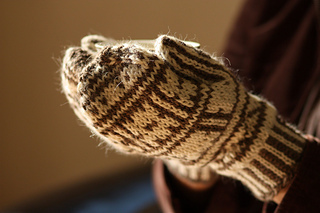 The mitts use a traditional Scandinavian shape. 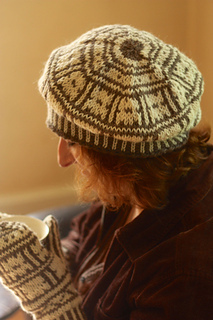 The example is knit in natural, undyed shades, perfectly reminiscent of this stone whorl made by the Sami. • 100 yards of two different colors of Classic Elite MountainTop Vista (50% wool, 50% alpaca) or other worsted yarn (color A and color B). • US size 8 5mm needles for knitting in the round. • Tapestry needle. • Smooth waste yarn or stitch holders. 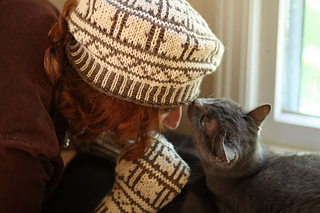 Knit in the round, decreases, stranded colorwork from chart, kitchener stitch.